At San Diego Comic Con 2018, a Resident Evil panel was held that talked about the upcoming release of Resident Evil 2. Thanks to Twitter user ateliermatanagi for collecting information from the panel to share. During the panel, Capcom said that they consider Resident Evil 2 a new title more than a remake, which allowed them to tear everything down and rebuild it the best way they possibly could. They wanted to design Leon before he became the dorky but cool action star of Resident Evil 4 and isn't quite a hero yet, but still went through multiple designs before landing on his current form to get it perfect. They also took this opportunity to brag about the Resident Evil engine's photogrammetry technology, being employed in Resident Evil 7, Devil May Cry 5, and this game. Real-life versions of Claire and Leon's outfits were scanned in to give them the most realistic look. Speaking of Claire, the team also went through a number of design iterations with her, but ultimately decided that they had to change her hotpants from the original game into a normal pair of jeans. The deciding factor was Claire's opening scene and how her design made sense for that. The look they settled on was ultimately "bike ninja," as evidenced by the real 1998 Harley Davidson motorcycle that she rides into town. Despite all the talk about Leon and Claire, the developers explained that they see the zombies as the main characters. They talk a bit about how zombies are an actual threat and not just a target to shoot at. A lot of work went into the zombies and even a few of the zombies in the game are modeled after the developers. The key for Capcom was to make sure the game both paid homage to the original while also establishing and staying consistent to its own identity. A Resident Evil 2 Collector's Edition was also revealed at the panel, as well as a Deluxe Edition. The base edition comes with just the game. The Deluxe Edition retails for $69.99 and includes the soundtrack and a bunch of costumes for Leon and Claire, as well as the classic Resident Evil handgun the Samurai Edge, specifically Wesker's model. 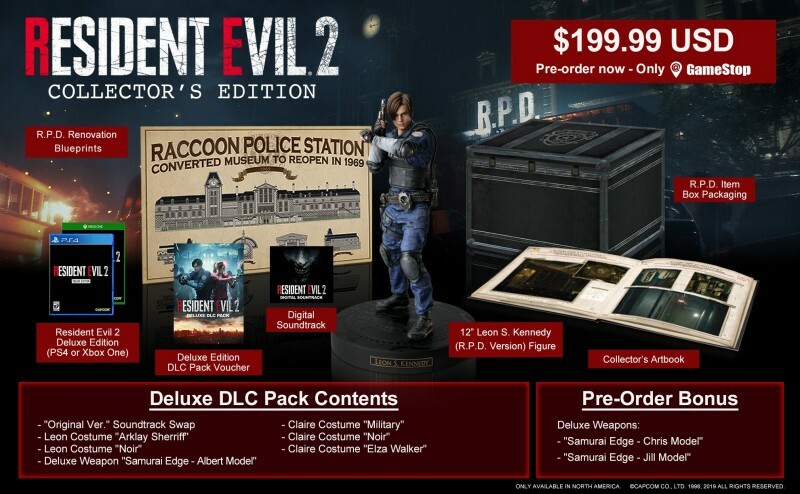 The Collector's Edition, which is exclusive to GameStop and is only for the console versions, includes those items as well as an artbook, a Racoon City Police Department lockbox, and a Leon statue based on the design from the new game.